Nursing a sick dog is an important technique for all dog owners to understand. A sick dog needs more care, devotion and attention by their owners than an otherwise healthy dog. Nursing a sick animal is considered to be an art; however, it should not be taken informally. Like a sick person needs more care, dogs too require more care when they become sick. For instance, the dogs with high fever should be given only some bread pieces and bulky non-vegetarian items must be avoided. These dogs should be kept in a quiet place and should not be bothered after medication. The animal who has taken medicines needs fondling and caressing by the owner. You must never raise the dog’s head too much as by doing so drug can be directly passed into respiratory organs like lungs. 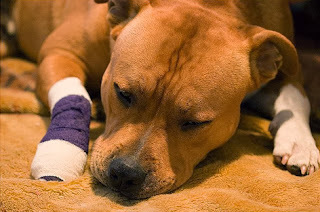 Giving the sick dogs warm fluids is one of the nursing steps that you must adopt. Safety must be given preference during the nursing process in any dog. When the dog has diarrhea and show symptoms of dehydration then you must add small doses of salt and glucose to the water cautiously. Similarly in case of vomiting dogs, ice cubes must be given along with egg whites to smooth the esophageal passage. Recently, a non-contact based infrared thermometer is available which can obtain the temperature of the dog without irritating it. If the temperature of the dog is too high then you must place it in a shaded area and provide proper ventilation. On the other hand if the dog is suffering from hypothermia then provide the dog with warm blankets for comfort.